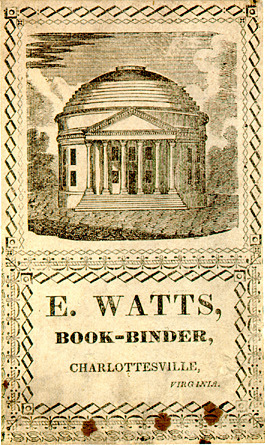 E. Watts, Book-Binder, Charlottesville, Virginia The earliest known printed image of the Rotunda, circa 1827. The verso is marked with an eagle holding the American shield and arrows. 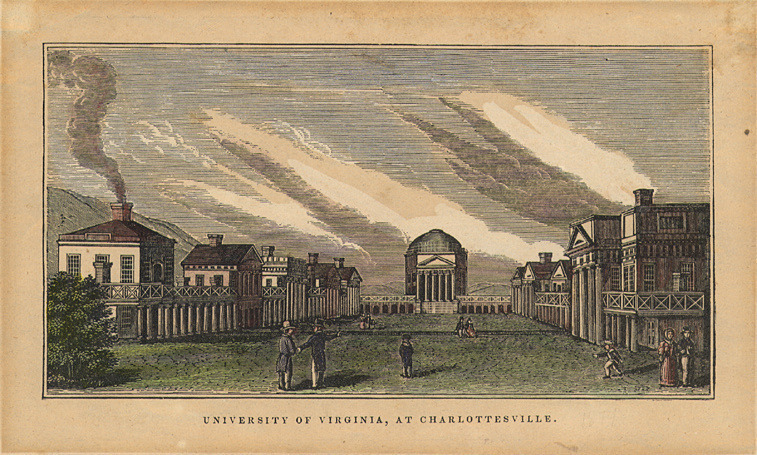 University of Virginia, Charlottesville, 1831. Drawn by W. Goodacre, N.Y. Published by J. & F. Tallis, London & New York. Steel engraving, 3 3/4 x 5 5/8. Betts Collection. 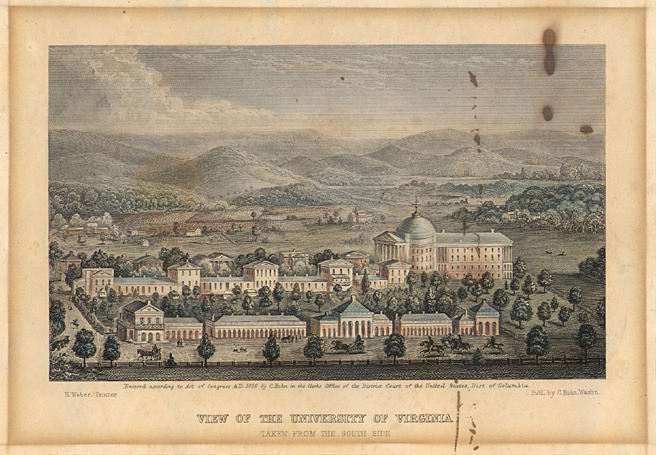 University of Virginia, at Charlottesville, 1843-45. Attributed to Henry Howe. Wood engraving, 3 1/4 x 6 1/8. Betts Collection. University of Virginia, 1856. Engraved by J. Serz. Published by C. Bohn. H. Weber, Printer. Steel engraving, 4 1/8 x 7. Prints Collection. The first view from the South to include the ranges. The Rotunda shows both the lantern and weather vane, added in the 1840s. View of the University of Virginia, Taken from the South Side, 1856. Unsigned. Published by C. Bohn, Washington. H. Weber, Printer. Steel engraving, 3 7/8 x 6 1/2. Betts Collection. Despite its title, this view is actually taken from the east. This print, showing Robert Mills' Annex, was used as a frontispiece for the University's catalogue. 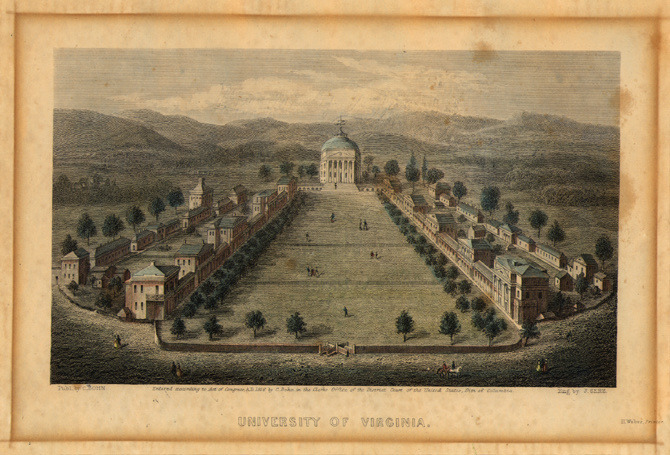 The University of Virginia, 1856. Unsigned, [by Porte Crayon]. Wood engraving, 2 3/8 x 7. Prints Collection. 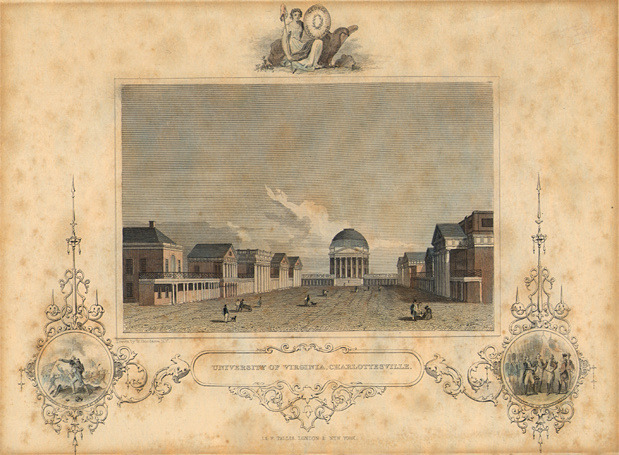 Probably the first print to show the Annex, it first appeared in an article called "Virginia Illustrated: Adventures of Porte Crayon and his Cousins," in Harper's New Monthly Magazine, August 1856.